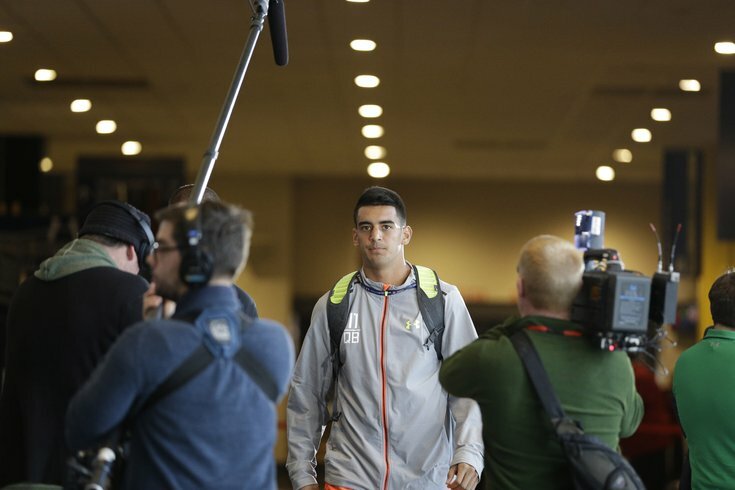 Marcus Mariota will run and throw at the NFL Combine today. Bennett has some running ability, but obviously that completion percentage in 2014 is concerning. Late round developmental project. We covered Bennett in much greater depth at the Senior Bowl. Here's a sleeper for you. Bridge had just a 50.7% completion percentage for his career, although most of it was in 2014. But… He’s big, has a strong arm, and 25 different NFL scouts have checked him out this year. He is an intriguing late round developmental prospect. • Cody Fajardo, QB, Nevada (6’1, 223): For anyone still hung up on the premise that Chip Kelly wants/needs a running QB, an off the radar guy is Cody Fajardo of Nevada. In 2014, Fajardo had five games in which he rushed for over 100 yards. Nevada runs a spread offense with similar concepts used in Philly under Chip Kelly, and could make some sense as a late round developmental project. • Garrett Grayson, QB, Colorado State (6'2, 213): Grayson had the best week at the Senior Bowl among the QBs competing in Mobile, although it wasn't exactly a star-studded group. He was the Mountain West Offensive Player of the Year, and his numbers were excellent. He was fifth in the nation with a QB rating of 166.2, as well as second in yards per pass attempt, at 9.5. There are some who think Grayson is the #3 QB in this class. Hundley has good size, he can move, and he has a strong arm. From a talent perspective, many analysts believe he is every bit as talented as Mariota and Florida State's Jameis Winston, the early consensus #1 and #2 QB prospects in the upcoming draft. However, the three most commonly cited negatives on Hundley are that he operates almost entirely out of the shotgun, he doesn't read defenses all that well, and he takes too many sacks (73 the last two seasons). Chip Kelly may not care all that much about Hundley's lack of experience taking snaps from under center, but the other two perceived negatives should be concerning. Can they work with Hundley through the mental side of the game? If so, his physical attributes are excellent. If the Eagles had interest, they'd probably have to get Hundley in the first round. Of all the teams in the NFL, Hundley said the Eagles' scheme most resembles what he ran in college. • Marcus Mariota, QB, Oregon (6'4, 222): Has this guy been discussed at all? If NFL Talent evaluators view Mariota as an elite QB prospect, the Eagles have little chance of moving up to land him. • Bryce Petty, QB, Baylor (6'3, 230): We covered Petty earlier this offseason. Petty has good size, good mobility, and a decent enough arm to be considered a legitimate early round quarterback prospect at the NFL level. Like Brett Hundley above, one thing that will scare away some teams is that he operated mainly out of the shotgun in a spread offense for the entirety of his career at Baylor. But again, that may not be as much of a negative in the eyes of Chip Kelly, who uses many of the same spread concepts as Baylor. Over his college career, Petty has thrown 61 TDs and just 10 INTs. Those numbers have to look appealing to a team that led the NFL in turnovers in 2014. The hulking Petty has linebacker's size (6-3, 238) and a tailback's burst and athleticism. He vertical jumps 38 inches, broad jumps 10-feet, 5.5-inches, squats 510 pounds and runs a 4.62 40. Over the weekend, Petty provided even more proof of his Freak merits to anyone around the Elite 11 camp in Oregon. Part of a series of challenges run by Team RWB, a group of Special Forces and career military men, Petty was a sight to see toting heavy sandbags up a hill back-and-forth for over a half-hour straight. When Petty arrived in Waco, he weighed 214 pounds, had a 31-inch vertical and clocked in the high 4.8s. Kazadi said his workout numbers, despite being quite a bit bigger, rival the great RGIII in almost every workout area and some of his weight work. "If you wanted him to go to 250 and make him a defensive end so he was chasing quarterbacks, he could do it," said Kazadi. "If you wanted to make him that old-school, over-the-tight end outside linebacker, he could do it. If you wanted to make him a tight end, he could easily do it. He can do all that." • Blake Sims, QB, Alabama (5'10, 218): Sims is short, but he does have athletic ability and a decent arm. However, he missed a boatload of open receivers at the Senior Bowl practices, and is a developmental project only. Here's a very good, and very detailed breakdown of Sims and how he might fit with the Eagles by Dan Klausner of Bleeding Green Nation. • Jameis Winston, QB, Florida State (6'4, 231): If Chip Kelly is interested in moving up to get himself a shiny new QB, it'll be Mariota, not Winston, and off-the-field concerns might have kept Kelly away from Winston anyway. #Culture. Still, Winston is obviously worth noting as a potential top overall pick.